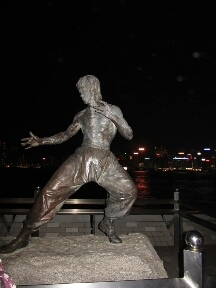 London to Hong Kong – Where's Walton? If you ever considered a flight with Jet Airways… Don’t. Just trust me. On the positive note through a mutual bad impression of Jet Airways I had a really nice experience meeting a lovely Chinese lady named Ivy from Chelmsford. Ivy was heading to Malaysia to celebrate turning 50 next week (which was crazy because she didn’t look a day over 30!) After neither of us were able to stomach the airplane food she kindly treated me to dinner during our flight change in Mumbai. How kind! So I arrived safely in Hong Kong… On first impressions, WOW this city is incredible! 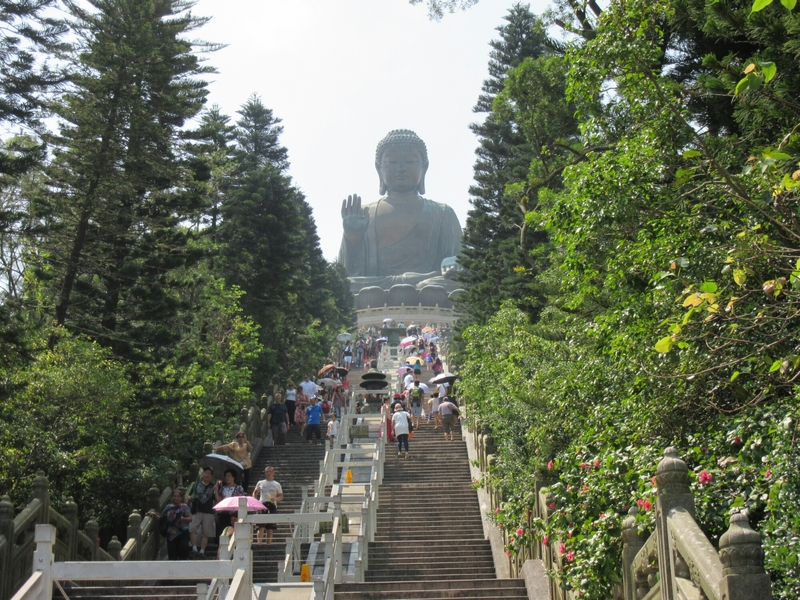 As soon as I got off the plane, I bought an Octupus card and was off to find the S1 bus to Tung Chung which was where I was taking a cable car to see the Big Bhudda. Now after a long flight, minimal sleep for 2 nights going up a mountain with a big backpack was not ideal but was totally worth it when I saw all the city mountain views. It was a excellent introduction to the city. 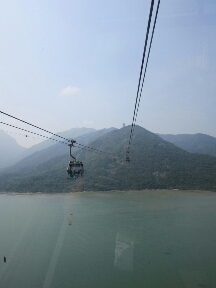 My biggest piece of advice for the cable car is buy in advance from their website… I was able to bypass a loooong queue and even though I booked a cable car for 11.45am – I arrived an hour early and didnt need to wait. Big Bhudda looked fantastic surrounded by all the beautiful mountain scenery. Although I didn’t go up the stairs, instead I did some topping up on the factor 50 and did some people watching from below. People were either showing their respects to Bhudda in prayer…or taking selfies. On the cable car down back to the city I was then advised by some locals that some buses to my hostel were suspended because of riots so I should get the MTR (HK’s Subway). The MTR was so easy to use, much more advanced than London Underground. 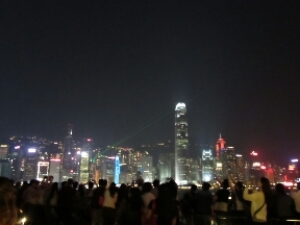 Also no issues at all with riots in HK so far (in case you were wondering). After arriving at my Hostel, the Yes Inn in Causeway Bay I decided to venture out for some noodles!!! I was very excited and intrigued to how I’d find dining alone in a new city. My plan was to look where the locals were and try the food. I eventually came across Butau Ramen which was small little restaurant but packed with city locals – they sat me down with the other single diners and gave me a paper dinner questionnaire and the menu – they had only 5 noodle dishes to choose from and from there u customised the flavour, veg and any add ons. I ordered ‘The Big King’. The ball in the middle is like a spiced pork meat ball that disperses into the dish. A layer of noodles and some thinly cut pork belly. It did cost me 93HKD (£7.50) and was well worth it. The spices and flavour were delicious – like nothing I’ve ever eaten before. 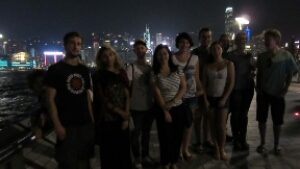 Later that evening I met for the first time with my tour group for ‘The Dragon Trip’. 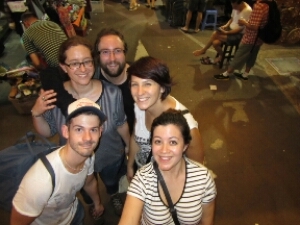 After introductions, we went to see the city light display followed by walking down Hong Kongs very own Hollywood walk and then our own way to the night market. I made my first purchase… a selfie stick. I joined the Asian craze. But I haggled it down to 20 Hong Kong Dollars which is £1.60. Barg. Hopefully I can get some nice film footage with it.